Dam: "La Wimps Sugar Bar"
"Angel" is an own Great Granddaughter of "Doc's Lynx". Pedigree Includes: Poco Tivio, Poco Bueno, Pep Up, Hollywood Gold, Joe Reed, Wimpy, King, Sugar Bars & Many More. "Angel" is an Exceptional Mare that we Bred & Raised Ourselves. 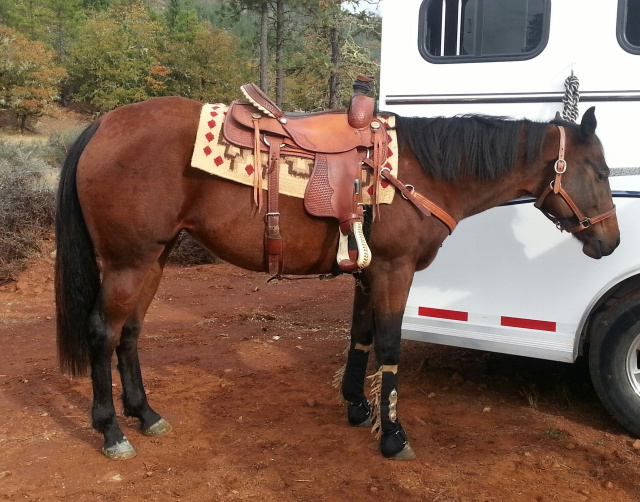 She is Broke to Ride, is a Quick Learner with great Athletic Ability & Lots of Get Up & Go. We are Extremely Proud of her Foals, her 2008 Sorrel Gelding "Cats Peterbilt 379" sired by "Cat K Call". "Pete" as he is called is an Awesome Stallion with Lots of Muscle, Cow and LOTS OF CHROME!! 4 White Stockings and a Big Blaze Face (Pete Resides with his Owners in Nevada). In 2013 Angel had a Gorgeous APHA Solid Bay Roan Colt - Barn Name "LA" (APHA Registered Name Pending) Sired by "El Gato Azul". "Angel" is now returned to being a Dedicated Riding Horse. Click Here to View our "In Loving Memory" page to see "Angel" as a baby with her Mama "La Wimps Sugar Bar"
We are Extremely Proud to Own such a Fantastic Bred Mare. Sired by the Famous "Zippin Bonanza Flash" AQHA Superior Western Pleasure Horse, Reserve World Champion 2 year old Snaffle Bit Western Pleasure. "Zippin Bonanza Flash's" offspring have earned over 1800 AQHA Performance Points and have earned over $80,000 in Incentive Fund and National Snaffle Bit Associations Winnings. Her Dam is an Own Daughter of the Famous Stallion "Mister Dual Pep" with LTE of over $43,785 and who is also a Million Dollar Sire. In Total "Missys" Pedigree Features: Zippin Bonanza Flash, Flashy Zipper, Zippo Pine Bar, Te N Te, Mister Dual Pep, Peppy San Badger, Doc's Remedy, Bueno Chex, Doc Bar, King and Lots More!! Missy has the Pedigree, Conformation, and Disposition that she is simply an Awesome All-Around Horse. We have had High Expectations for her, and she has met every expectation and even gone above and beyond. Missy is Broke to Ride and has also been an Outstanding and Amazing Broodmare, whether she is doing her job as a riding horse or as a momma horse she Loves it and is Proving to be an Outstanding Horse with a Disposition that simply can not be beat, she is Truly a Barn Favorite! !